On Wednesday, April 3, the Eastern American Diocesan Lenten Clergy Retreat held at St. Alexander Nevsky Diocesan Cathedral in Howell, NJ, concluded with the celebration of the Divine Liturgy of Presanctified Gifts, led by Bishop Nicholas of Manhattan. Concelebrating with His Grace were the head of the Russian Ecclesiastical Mission in Jerusalem, Archimandrite Roman (Krassovsky), and diocesan clergy. Also praying in the altar was Metropolitan Jonah (Paffhausen; former primate of the Orthodox Church in America). The service was held under the aegis of the myrrh-streaming icon of the Mother of God "Softener of Evil Hearts," currently on its annual travels throughout the Eastern American Diocese. Priest Mykhailo Mykhailenko (cleric of St. Vladimir Church in Miami, FL) was awarded the right to wear the nabedrennik. 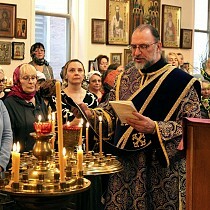 Prayerfully singing was the choir under the direction of the mæstro Vladimir Gorbik, conductor of the Moscow Metochion of the Holy Trinity-St. Sergius Lavra, who has become the instructor of numerous conductors and choristers of the Diocese. Many believers came to pray at Liturgy and venerate the icon of the Mother of God; a majority of them received Christ’s Holy Mysteries. Upon conclusion of the service, Bishop Nicholas thanked the clergy and faithful for their shared prayers, thanking Fr. Roman for serving in the Synod of Bishops in New York City and St. Alexander Nevsky Cathedral, for his informative lecture during the pastoral conference. He called on the clergy and parishioners to prayer for the clerics and monastics living in the Holy Land and to support them materially, by participating in the annual collections. His Grace thanked the singers, led by their conductor, mæstro Vladimir Gorbik, and asked them to continue their prayerful work, glorifying our Lord God and Savior with singing, delivering consolation to the clergy and prayers. Bishop Nicholas also thanked the guardian of the icon "Softener of Evil Hearts," Sergei Fomin, who for the eighth year visited the Diocese during the time of the Lenten Retreat with the holy image. "There are silent prayers in our services that are read by the clergy in the altar. Today during the Liturgy, there was a prayer with these words, ‘We pray and ask that the Lord God show us to be inheritors of His Kingdom.’ This prayer is read before God’s Altar. 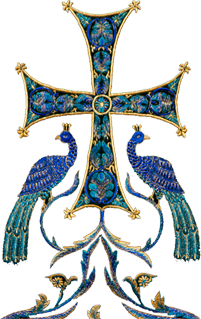 We ask that might be vouchsafed this grace, this blessedness with God, and that we might inherit life eternal. In these days we pray, fast, and prepare for the feast of Holy Pascha. We must work throughout our whole lives to prepare to inherit the Kingdom of Heaven. And only with God’s help we might attain this. "It is tumultuous around us, and sins and temptations abound. But when we pray together, labor, and support one another on this path, we may then inherit the Heavenly Kingdom." Bishop Nicholas wished for the clergy and faithful to labor diligently, rightly bearing the cross given to all of us for the salvation of our souls. A group photograph was taken of the clergy at the end of the retreat. Later, all gathered in the parish hall, where a luncheon was served and brotherly interaction continued. During the meal, the resolution of the clergy retreat was read and unanimously adopted, and a number of notable events in the life of the Diocese were announced, more information on which will be posted on the diocesan website in the future. Concluding, Archpriest Gregory Naumenko (dean of Upstate New York), thanked cathedral rector Archpriest Serge Lukianov and all volunteers on behalf of all those gathered for working to organize and run the retreat.